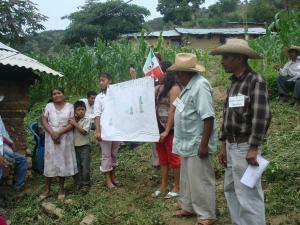 The Group for Environmental Studies (GEA) was set up to work with communities to find sustainable solutions to environmental and social problems.The programme for peasant management of natural resources designs and implements long-term participatory projects for sustainable management of marginalized communities’ territories, focusing on micro-watersheds and their natural resources. “Land use planning at community, watershed and regional levels, training and exchange of experiences, as well as basic research and peasant experimentation are all vital to the success of the programme” explains Catarina Illsley, programme coordinator. “The programme seeks to create new social and technological alternatives through dialogue between peasant communities, technicians, academia and decision-makers”. One of these projects is “Agua Compartida para Todos” (“Shared Water for All”), which is funded by the Gonzalo Río Arronte Foundation and works with 21 peasant communities in the State of Guerrero, Western Mexico. The project aims to strengthen the capacities of community institutions and peasant families to develop sustainable management techniques to control of their own land and natural resources. “Shared Water for All” recognizes the diversified and multiple uses of the territory and water used by peasant families and communities. It considers the local institutions and regulations for the access and management of the collectively owned land and natural resources. A participatory method has been developed for the diagnosis of the management issues around each microwatershed including environmental, socioeconomic and technical issues, followed by alternative proposal planning, implementation, monitoring and assessment. The project offers each Community Water Committee an enlarged satellite image of their community to work The Community Water Committee explains its annual plan at a regional peasant-to-peasant meeting out their annual microwatershed plan and a permanent training program. It also shares in the peasant-to-peasant exchange of knowledge and experiences. Yearly plans lead to fulfilling the “watershed dreams” visualized at the beginning of the process. Techniques including water and soil conservation on slopes and agricultural plots, agro-ecological and soil restoration, small dams and water catchment projects, protection of fresh water springs, forest management and ecological sanitation facilities, have resulted in the restoration and protection of water sources, decreased erosion, restoration of highly eroded soils, availability of clean water and recuperation of habitat for birds. Close to 150 peasants are engaged in this learning process. Community- based plans have also given the communities a valuable instrument to use in negotiations with government and other officers, as a way to express and advance their own interests and solutions. The methods developed and lessons learned in this programme could be extended and adapted to other rural regions of Mexico, where land and natural resources are collectively owned (the case in over 50% of the country). Through FANMex and FAN International, GEA can share its successful experiences and reach decision-makers at national, regional and global levels. Grupo de Estudios Ambientales A.C.